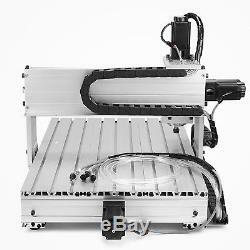 4 AXIS 6040Z CNC Router 3D Engraving Drilling Machine With 800W Spindle. 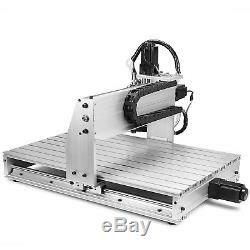 CNC USB 6040 is suitable for Industry, Technology Research, Advertising Design, Arts Creation, Teaching, Student Project and Hobby Purposes. 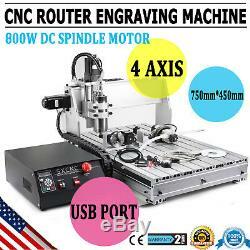 Application CNC USB 6040 is designed for large area engraving work. 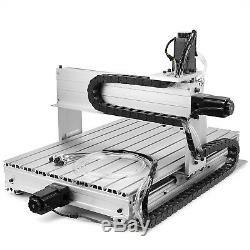 The Computerized CNC Engraving and Cutting Machine is suitable for various materials, such as WOOD, PMMA or other plastic, MDF board, native wood, PVC, Acrylic, wood, composite board plywood, It can be used widely to process or make adverstising signs, PCB, nameplates, badges, seals, bronzing plate, aluminium alloy, acryplates, ABS resin double color plate, PVC foaming board, indentation plates, signs, construction models, instrument panels, wooden products, etc. 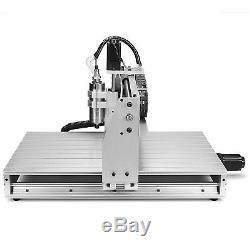 If you want to make sure this laser engraver will engrave on a certain item or cut a certain item, you are welcome to send me a sample of that item and I will test it for you. 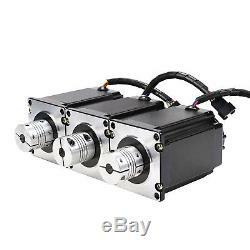 Notes:The Fourth Axis is also called A axis, which is assembled to engrave cylinder or 3D shape machineHow to use How to use 1. Assembling and locating the CNC machine on steady desk well. Make sure that your computer has a on-board parallel port output. Installing a CNC control software and Drive such as the CNCUSB on your computer. Connecting the control box with the CNC machine and your computer. Following our manual or guideline to set up the software. 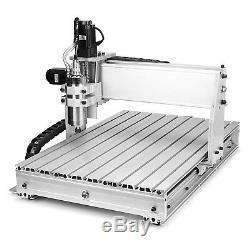 You can enjoy making you dream with using our CNC machine now. Effective working travel: 400(X)mm590(Y)mm75(Z)mm. Thickness of the materials: 100mm(the distance between Z axis and the bottom of the working station). Frame materials: aluminum alloy 6063 and 6061. Driving units X axis: NEW 1605 ball screws. Driving units Y axis: NEW 1605 ball screws. Driving units Z axis: NEW 1605 ball screws. Sliding units X axis: Dia. Sliding units Y axis: Dia. Sliding units Z axis: Dia. Stepping motor type: 57 two-phase 3A , super-low noise. Spindle motor: 0.8KW water cooled spindle, 24000RPM. VFD power: 1.5KW VFD. Principal axis collet: ER11/3.175 collet. 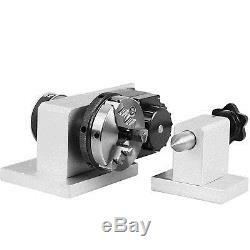 Spindle speed: 24000rpm/min (PWM stepless speed regulation). Engraving accuracy: better than 0.04mm (has been tested). Spindle precision: radial runout0.03mm. Control unit: triaxial one-piece drive + ring variable power + PWM speed. Carving Instructions: G code/TAB files/nc file/NCC files. Communication interface: through parallel or USB connection with computer. With four axis(rotary axis) and tailstock. More steady and strong equiped with aluminum alloy frame materials. Can be controlled only by desktop computer, not suitable for laptop. Mach 3 software is simple and intelligent. Emergency stop button enhance security. Large 3D engraving in soft wood, MDF board, native wood, PVC, Acrylic. Stepping motor knob is useful for small positioning adjustment , with steady and strong support structure. Cover plates reducing pollution for the screws and shafts. Thick 15mm aluminum 6063 plate, more stronger. The reinforced and thickened machine body make transportation absolutely to be safer and longer life time. The chrome shafts is not easy to deform, suitable for long time use. Flexible coupling can be used for high torque transmission. High Precision Stepping motor makes engraving more precise. The NEW 0.8KW water-cooled VFD spindle is available operating for long time, which can reinforced the processing ability of the machine and can be used to process aluminum alloy and hard wood. This item already be equipped NEW 1605 ball screws. Anti-blackflash, high precision, long life circle. 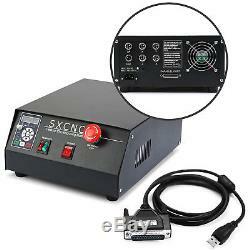 6040Z 4 AXIS Engraving machine. If you have a problem with the product. We will require a picture of the damaged part for verification. All items are dispatched from our warehouse in HACIENDA HEIGHTS, CA. Some products may be dispatched in more than one carton. These charges are the buyers responsibility. 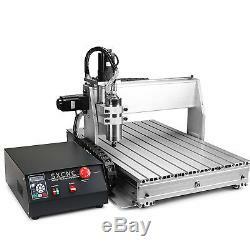 The item "4 AXIS ENGRAVER USB CNC6040Z ROUTER ENGRAVING DRILLING MILLING MACHINE 3D CUTTER" is in sale since Wednesday, November 29, 2017. 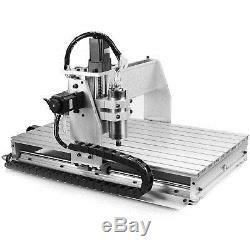 This item is in the category "Business & Industrial\Manufacturing & Metalworking\Woodworking\Equipment & Machinery\Routers - Professional". 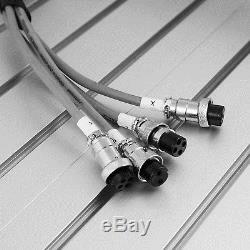 The seller is "zbondfactory-1" and is located in Hacienda Heights, California. This item can be shipped to United States.